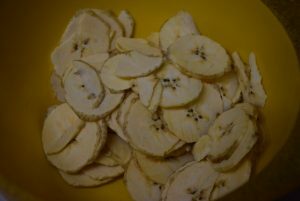 Are you seeking some snacks for munching this winters? Well then, no more seeking ; when you can make yourself healthy munching snacks right from scratch. 1. 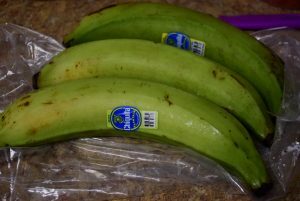 Take green raw bananas or plantains. Chop off their two ends. 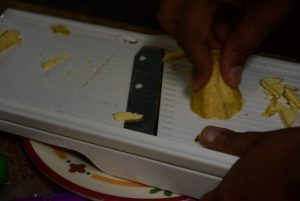 Peel them with a peeler or knife scraping the green contours too. 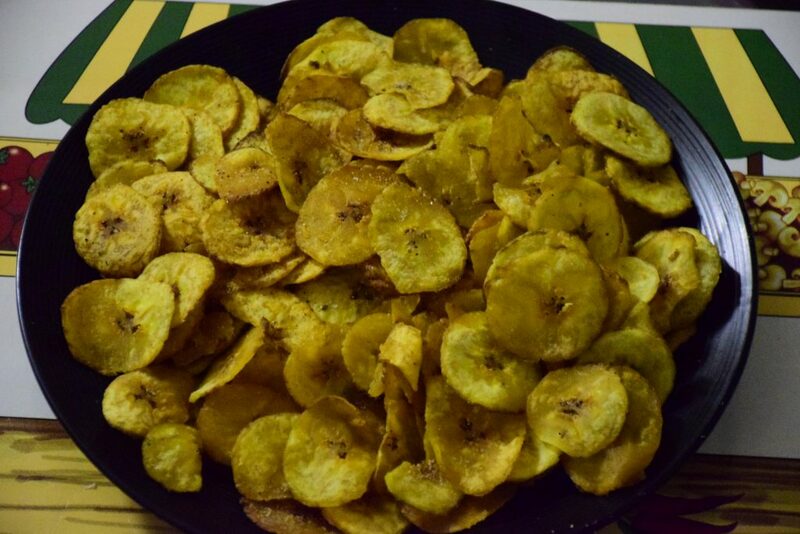 You will notice that plantains are yellowish in color ,while the bananas are white in color. 2. Mix salt and turmeric in water and keep ready. 3. Now take a bowl or plate. Keep your slicer over it and slice the bananas in about 1/4 inch thickness. They should not be very thin or they will taste heavily salted and burn while frying. Once you are ready with the slices, heat the oil at medium heat. 4. 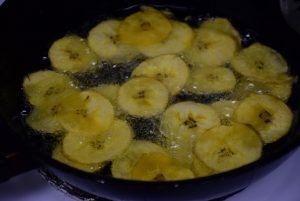 Ideally, the process demands to directly slice bananas over the hot oil with a slicer. But since, I am a newbee , I sliced them separately in a plate. Don’t keep them unattended for long once they are sliced or they will turn blackish in color because of their iron content. 5. Once the oil is just warm enough, add the slices one by one separating one from the other so that they don’t stick while frying. Keep the oil on medium to low. Stir them continously so that they don’t stick and get even heat. 6. After about 1 min , add the haldi-namak-pani (saline turmeric water) a ladle-ful to the hot oil and let them fry till the bubbling stops and noise of water stops in the hot oil. This way they get the yellow color and salty taste in the end. However, if you like them with less salt, you may fry them for 6 to 7 mins on medium heat or till they are crisp to touch and take them out on paper towel lined plate. 7. After about 5 mins ,when the bubbling stops, check for the doneness by taking out one chip and breaking it. If it breaks quickly and makes a crunchy sound, they are ready. 8. Take them out on a paper towel lined plate and if you feel the salt level has to be adjusted , now is the time. 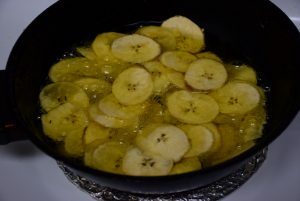 Yes, you can add more salt, pepper (red or black) and then mix them with these chips while they are still hot and oily. We cannot spice them once their oil is dried out. 9. Similarly fry all the slices. Keep on adding the saline-turmeric water for the salt and color. Also , if you feel the turmeric is not well dissolved in water and not enough for them to change color, you may add it directly in oil in pinches . 10. Let them cool down to room temperature. Now you can store them in air-tight containers and enjoy till they last. Crunching of these chips with hot tea makes a perfect evening time. I hope you enjoy this recipe as much as I did. 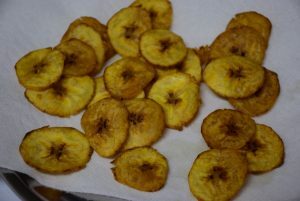 Take green raw bananas or plantains. Chop off their two ends. Peel them with a peeler or knife scraping the green contours too. 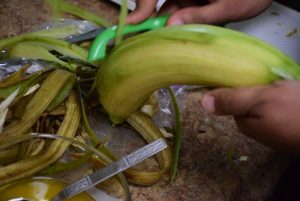 You will notice that plantains are yellowish in color ,while the bananas are white in color. Mix salt and turmeric in water and keep ready. Now take a bowl or plate. Keep your slicer over it and slice the bananas in about 1/4 inch thickness. They should not be very thin or they will taste heavily salted and burn while frying. Once you are ready with the slices, heat the oil at medium heat. 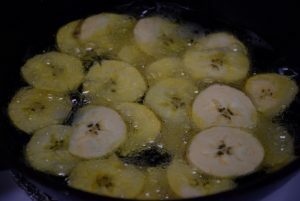 Ideally, the process demands to directly slice bananas over the hot oil with a slicer. But since, I am a newbee , I sliced them separately in a plate. Don't keep them unattended for long once they are sliced or they will turn blackish in color because of their iron content. 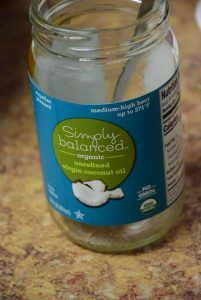 Once the oil is just warm enough, add the slices one by one separating one from the other so that they don't stick while frying. Keep the oil on medium to low. Stir them continously so that they don't stick and get even heat. After about 1 min , add the haldi-namak-pani (saline turmeric water) a ladle-ful to the hot oil and let them fry till the bubbling stops and noise of water stops in the hot oil. This way they get the yellow color and salty taste in the end. 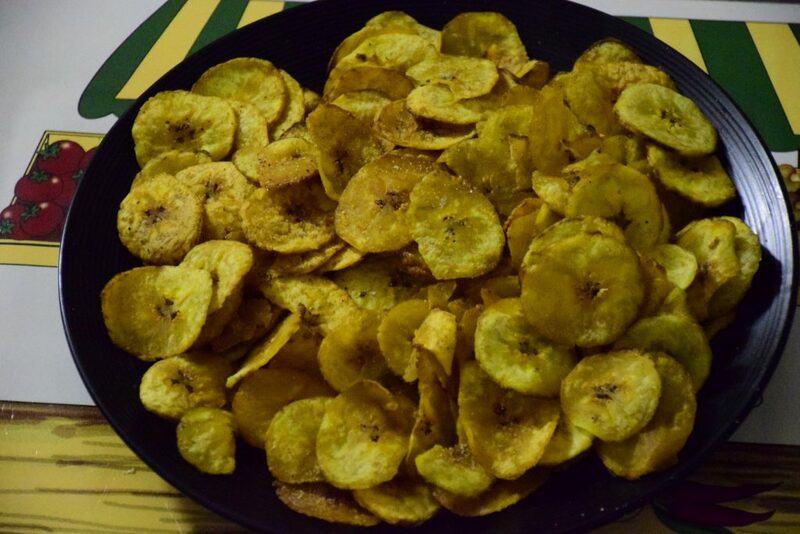 However, if you like them with less salt, you may fry them for 6 to 7 mins on medium heat or till they are crisp to touch and take them out on paper towel lined plate. After about 5 mins ,when the bubbling stops, check for the doneness by taking out one chip and breaking it. If it breaks quickly and makes a crunchy sound, they are ready. Take them out on a paper towel lined plate and if you feel the salt level has to be adjusted , now is the time. Yes, you can add more salt, pepper (red or black) and then mix them with these chips while they are still hot and oily. We cannot spice them once their oil is dried out. Similarly fry all the slices. Keep on adding the saline-turmeric water for the salt and color. 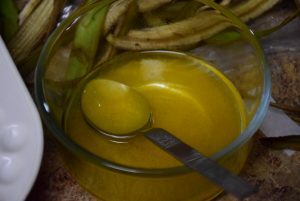 Also , if you feel the turmeric is not well dissolved in water and not enough for them to change color, you may add it directly in oil in pinches . Let them cool down to room temperature. Now you can store them in air-tight containers and enjoy till they last. 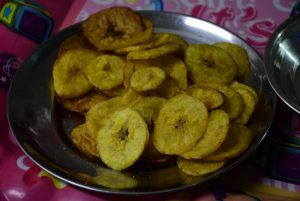 This entry was posted in Appetizers, Food, Kids- Favourite, Recipes, Snacks and tagged banana, better than fried food, Carenshare, coocnut oil, crispy, crunchy, Fried, haldi, kele, Kerala style, peeled raw bananas, Plantain, regional, safely, salt, shweta jindal, slicer, thin, turmeric, water, Yellow chips like store bought, zindagisikhati.